The WL95 is built for performance and operator comfort. The variable hydrostatic transmission provides excellent traction and high travel speeds (12.4 mph). The WL95 is built for performance and operator comfort. The variable hydrostatic transmission provides excellent traction and high travel speeds (12.4 mph). With a standard 2-cubic yard bucket and straight bucket tipping load up to 14,394 lbs., the WL95 is capable of moving more material efficiently. Keeping with the Wacker Neuson tradition of offering machines with a compact design, the WL95 is just that; the compact design for a loader this size enables a tight turning radius and generous steering angle. The articulated joint and a pendulum axle at the rear ensures optimum maneuverability and traction in any situation. The WL95 offers return-to-dig function, ride control and a reversing fan as standard ensuring optimum productivity. As is expected with a wheel loader in this size class, the Wacker Neuson WL95 offers ergonomic and operator comfort features. Work all day in this large cab with plenty of legroom, comfortable operator seat and clear view of attachments. The console features a multi-functional joystick and a jog dial for easy adjustment of the hydraulic flow rate to the attachment. The fully glazed cab provides excellent visibility and air conditioning offers a comfortable, fatigue free work environment. The easy to view, 7-inch color display keeps the operator informed of all the machine's functions. The WL95 is powered by a 136 horsepower Deutz 3.61 engine with a DOC and SCR aftertreatment system, providing a standard auxiliary hydraulic flow of 31 gallons per minute. Daily and regular service access is made easy with an accessible wide opening engine hood and removable fenders which allow for easy reach to hydraulic and electrical components. 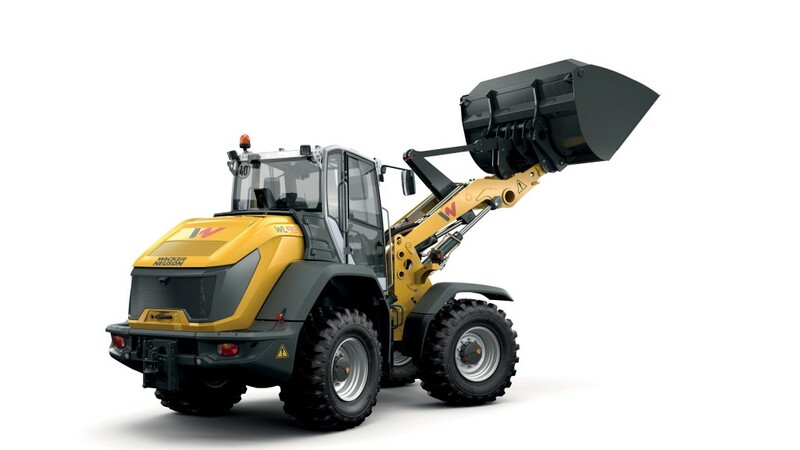 Wacker Neuson's new WL95 wheel loader is an excellent addition to the company's line of articulated, all-wheel steer and telescopic wheel loaders that have the power, performance and operator comfort to tackle any job and quickly and precisely manage all types of loads.